As you all know by now that crepes are my kitchen staples as they are replacing the bread. I eat gluten free and my husband (he does not have gluten issue) is too obviously. But today, since he started to crave bread, I will make him one of my non GF bread recipe as a surprise. I posted another crepe recipe before but I would like to share this recipe with you too. I ran out of Quinoa flour and I could not find, so I bought brown rice flour and made crepes with it. The previous crepe recipe was grain free but if you did not have the ingredients, I included the optional substitutes that could make it gluten free but not grain free. There were also optional ingredients like egg but in this crepe recipe, you need egg. Mix them all well and add water to make the runny consistency. Heat your non stick pan with oil of your choice (coconut oil, butter), pour the mixture (about 1/2 cup) from one side of the pan (8″ ) and swirl around to make a thin layer. Once this side is cooked, it should move easily, flip over the other side and cook that side too. The amount of the mixture you pour into your pan depends on the size of your pan. It can be a 8″, 9″ or even bigger pan. So you have to adjust. What I started to do is, instead of using cup, I directly pour from the container of the mixture, from one side of the pan, swirl the pan, if I need more, pour a little bit more to where the crepe is left short on the pan. 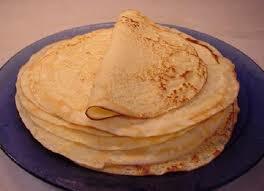 Make sure your pan is not scratched or damaged, crepe will stick. If you need, you can lift the crepe when on pan and add a little more oil to swirl and flip over. I have been eating gluten-free for a while. It has been two months so far. 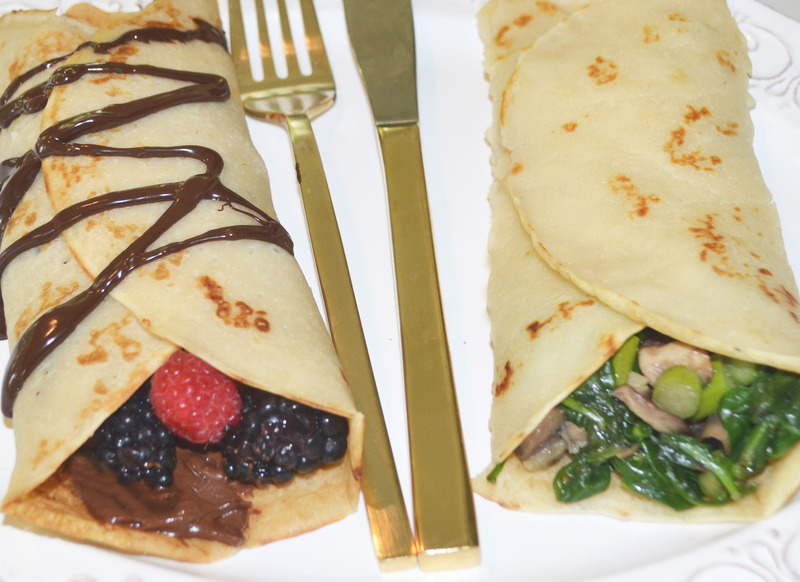 Whenever I crave bread I make pancakes or these crepes. I use them for desserts (chocolate mousse and raspberries/blueberries and whipping cream) or for savory dishes (put chicken and salsa in and sour cream on top after rolled; put goat cheese, spring mix, olive oil, red pepper flakes + oregano + Himalayan salt and roll; enjoy with plain organic butter and Himalayan salt; put veggy omelette in and roll etc.) We even eat them plain with dishes as a flat bread. Simply mix all the ingredients, pour (about half cup, depending the size of your pan) on your hot and oiled (butter/coconut oil) non-stick pan, swirl around to make a thin layer and cook both sides. Make sure you use non-stick pan and it is not scratched or damaged. First scratched non-stick pan is toxic, second your crepe will stick and you won’t have your perfect crepes.